Editor’s Note: This is the third in a series of guest posts that will be appearing on this blog about teaching math to English Language Learners. 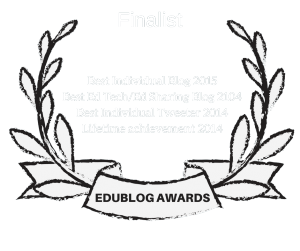 I’ll be posting them over the next few weeks, and adding each one to The Best Resources For Teaching Common Core Math To English Language Learners. The first in the series was “Speaking of Math: It’s time to talk in class” by Alycia Owen. The second was “Support Reading, Support Mathematics Understanding” by Cindy Garcia. The third was Teaching Math To English Language Learners by Hannah Davis. 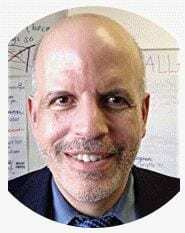 Nicholas Pesola has been a mathematics teacher for 14 years at Marble Hill School for International Studies, a public school in the Bronx, NY. He has taught all levels of high school mathematics to native speakers of English and ELL alike, and currently teaches Algebra 1 to ELL and SpEd populations, and AP Calculus. If you have questions or would like to open a dialogue, he can be reached at npesola@marblehillschool.org. My work has run the gamut of teaching experiences, but a fair amount focuses on a 9th grade math class with our lowest level ELL population. I have often found the pursuit of professional development in teaching math to ELL’s frustrating because I find colleagues across the city reluctant to join me in this pursuit, and often the workshops I attend are geared towards the idea that language barrier is our only issue. This strikes me as disingenuous when my classroom contains many Students with Interrupted Formal Education (SIFE) and those who have not been diagnosed for Special Ed needs for various reasons. It is difficult to find the right support and guidance for teaching mathematics to this ELL population. For teachers who feel the pressure of high-stakes testing and expectant administrations, pushing a Common Core curriculum on a beginner ELL population only to have less than 30% of your class pass the state test, I would like to argue that starting the year teaching such a curriculum can have deleterious effects on their math education. Pushing students prematurely down this path creates greater holes in their conceptual understanding, with residual academic and psychological effects as they move from course to course, teacher to teacher. Even if you are extremely thorough, you are likely to find the class’ progress stalls for long periods of time. 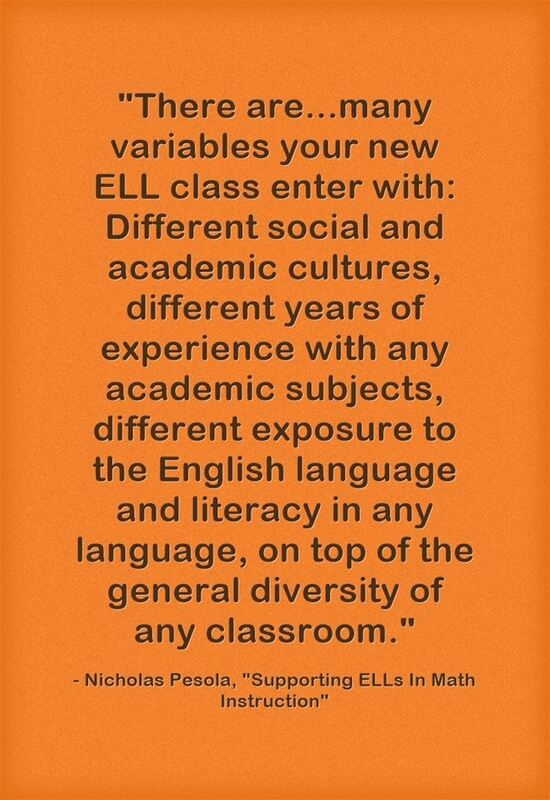 There are too many variables your new ELL class enter with: Different social and academic cultures, different years of experience with any academic subjects, different exposure to the English language and literacy in any language, on top of the general diversity of any classroom. The teacher needs to control some variables first before any substantial learning can begin, and this can take the majority of the first semester. I would argue that we should see ourselves foremost as facilitators of the transition to learning at our grade level in this first semester, and this is the general blue-print I propose to get there: Consider a 3-Unit structure where Unit 1 sets the culture, Unit 2 practices the culture on an essential prerequisite topic, and Unit 3 applies that topic at the next level to support their transition into the core curriculum. Create an environment of inclusion for all ethnicities, languages, and levels in your classroom. Develop ‘Our Math Culture,’ which emphasizes growth mindset and rewards exploration and collaboration, and helps students to transition to academics in your school. Establish structures and protocols for soft skills that students can use to enhance their own learning and literacy for their entire academic experience. This includes numeracy games and puzzles that develop the language of numbers and operations for basic classroom discussion. One such game I call ‘Dib Dub,’ where you select a digit for ‘Dib’ and a second digit for ‘Dub.’ Students take turns counting, but when a number is a multiple of those digits or contains the digits, the student substitutes the words Dib and Dub accordingly. If your classroom has multiple languages, sharing words in different languages becomes a great way to ease all students in the majority and minority into an inclusive classroom, and everyone feels their background is valued when the class repeats their language. Days are devoted to math puzzles that are open-ended, have a ‘low floor / high ceiling’ to engage and give all levels a chance to contribute. One such activity is ‘1-2-3-4’ or ‘Four 4’s’, where groups seek ways to combine these numbers in full arithmetic expressions that equal all numbers from in an arbitrary range. There are many ways to extend the learning to multiple sessions and bring about more discoveries with each puzzle, illustrating and discussing fundamentals of pre-algebra. Every classroom structure and protocol should be repeated and applied so students can see the value added to their learning experience, whether it be group interactions and presentations, or helping them to develop notebooks that improve their literacy and study habits. For the latter, I have the students use color-coding, and develop activities specifically pushing them to reference and develop literacy with their own notes, otherwise notebooks become a mindless classroom procedure that students do without reflecting or studying. These are just a few ideas to address Unit 1 goals. Explicitly demonstrate Unit structure and the purpose of each phase in their Unit learning process. Reinforce ‘Our Math Culture’ with group and individual structures directed towards more specific math goals. Develop depth of understanding and application of prerequisite math concepts. Class activities and discussion still center around basic math vocabulary, but generally I keep the English literacy load as light as possible. I lean towards math without words, with situations that are as visual and observational as possible. Unit 3 begins to expose students to the core curriculum concepts. My progression from my Unit 2 is currently Proportional Relationships, and we begin to use variables in meaningful ways. The content directly relates to Unit 2 so that the same examples can be recalled for a deeper dive. Ideally, your Unit 3 allows you to access grade-level material without placing high literacy demands on the students yet. They gain experience with minimal language-based confusion. By the time you are three units in, you will find the class making significant leaps in their overall abilities across subject areas, so that they are ready to engage in grade-level material and make better sense of it. The patience will have paid off because they can learn quicker with fewer misconceptions, and they will have the confidence to take on bigger challenges. For teachers who are afraid of investing so much of the year to off-curriculum learning, I would consider that a smaller amount of the course learned effectively will ultimately lead to better results and math futures. Wow! What a great post. I that you try to keep the English literacy load as light as possible to support my ELLs in the math classroom. When you must give students word problems from the curriculum, do you supplement the word problems with a lot of visuals? I also see that you lean towards math without words, with situations that are as visual and observational as possible. Would you mind explaining what that looks like? Have you tried number talks? When I do give word problems, I start with visuals, and then do a Three Reads protocol. A basic Three Reads would be to leave off the direct question in the word problem, and answer the following three questions after each read: What is the problem about? What are the quantities in the problem? What math questions can we ask about the situation? I also do variations when I leave the direct question in. Then I ask after each read: What are math words and what are words we don’t know? What is the situation in the problem? What is the information we know and don’t know that can help us with the problem? With situations that are visual and observational, it can be something as simple as balance diagrams or pictures of grouped items that have a certain value (e.g. – 3 apples and 2 oranges cost $3.50, 2 apples and 3 oranges cost $3.70), or something using manipulatives like blocks, or experiences and experiments that lead to more open-ended math work. I do use number talks for many different things: to improve arithmetic numeracy, visual estimation and calculations, and to further algebraic principles. For arithmetic numeracy, I craft sequences of arithmetic expressions that get progressively harder to focus on a specific skill, like teaching student how to mentally multiply two-digit numbers by starting with single-digit multiplication. During the sequences, you give students a certain amount of time to respond as a group. When students start to get stuck, you pause to discuss methods. Alternatively, I start with the hardest problem and ask students to find as many ways to get to the solution as possible, then discuss. Visual estimation and calculations are useful in the beginning when emphasizing different ways to see mathematics, like counting dots in a pattern or finding the next number in a visual sequence. Furthering algebraic principles can often stem from similar activities, like understanding how distributive property is used when multiplying two-digit numbers. If you want to take your number talks to the next level, especially as the math gets more sophisticated, I recommend protocols developed by Amy Lucenta and Grace Kelemanik in ‘Routines for Reasoning’, such as Connecting Representations. How do you use number talks in your classroom?